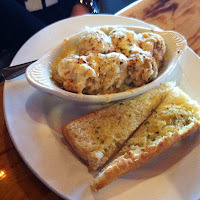 Tender mushrooms loaded with seafood stuffing and topped with Monterey Jack cheese, serve with garlic toast, for dipping. 5. Broil for 8 to 10 minutes, until the top is brown. 1. Saute the celery, onions, and garlic in the margarine until translucent. 4. Drain most, but not all, of the liquid from the pan. 5. Stir in the shrimp soup base and the cayenne and white peppers. 6. Fold in the croutons and bread crumbs.